With food prices at a record high, chaotic weather systems destroying crops the world over, and no signs of population growth slowing down anytime soon – never has growing your own produce been more important than it is right now. So as city dwellers turn to mini-farming, technology is playing an increasingly important role in maximising crop yields from a small place. Today I’d like to highlight some of those great projects. I’d consider myself a mini-farmer. For half the year, we are 90% self sufficient in vegetables; year round we have a constant supply of eggs from our free range hens. A polytunnel or two helps to extend the growing season with the unpredictable and ridiculously wet English weather, as well as providing year round salad leaves. All this from a small allotment plot and ex-council terraced house in a sleepy suburb of London. The past year has been spent digging over, building and tidying; this year I’m hoping integrate a little more technology. Combine an electric drill, a car battery, an Arduino and some solar cells; and you get an electric chicken coop door opener. During the winter months, getting up at 5am is the last thing on your mind, but chickens are temperamental and need to be up with the light. For mini-farmer makerman64, this was too much. Check out the full build instructions at his blog; the video below shows you how cool this is though. 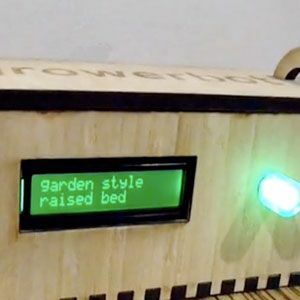 Recently successfully funded, the Growerbot is a self contained Arduino-based gardening control and monitor package with light, temperature and moisture sensors; connect to your light source and sprinklers for complete control and hands-off growing. The aim is to have ideal location and plant specific growth patterns available online, so anyone can download the best – tested – methods and use those to automatically set ideal conditions. A DIY set for grower bot was available for just under $100 on the Kickstarter. Significantly more advanced than the Growerbot, Horto Domi is a complete geodesic raised bed system with built-in earthworm bin, but otherwise much the same. Sadly, $500 makes this fairly prohibitive for most of us, especially when the whole idea of growing your own is to save money (well, that and not poison yourself with the tremendous amount of chemicals in most supermarket produce). If nothing else, building a geodesic dome looks like it could be a lot of fun. The hotly named GVCS 50 is (aiming to be) a collection of open source plan-and- build instructions for all the machinery needed for a modern civilization; mostly, this means farming equipment. The idea is to empower farmers and small communities the world over to be able to live with at least some of the modern comforts – without breaking the bank for extortionate brand name machinery. They’ve distilled this down to 50 different machines, each of which is fully user serviceable and can be fabricated easily (and therefore, low cost). Right now, the “civilization starter pack” contains complete training materials for just 4 of the proposed 50 essential machines, but however lofty the goal, it’s certainly an admirable one that can really benefit small communities everywhere. And if you like, you can get building the tractor right away (it’ll take 2 people approximately 8 hours, they reckon). Seriously. Since we have scales that tweet your weight, and the general quality of tweets How The London Riots Showed The Dark Side Of Social Media [Opinion] How The London Riots Showed The Dark Side Of Social Media [Opinion] As I sit here wondering how things will pan out for London after the riots, I can’t help but turn towards Twitter for relevant information about my local area. The media is repeating the same... Read More is so bad anyway, we might as well start putting houseplants on twitter too. 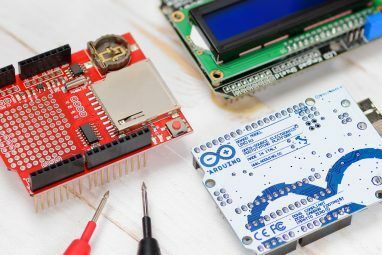 Luckily, there’s a complete kit availble called Botanicalls from Sparkfun for the low, low price of $99.95. Yes, that’s how much it costs for a houseplant to tweet. all you need to do is to remember to check on Twitter to see if your plant needs water. In my case, that would be a once a week; the cries of my Dracaena will likely fall on deaf ears. Some of these mini-farming projects sound great in theory, but I can’t help thinking the effort that goes into setting up automatic sprinklers and various sensors probably doesn’t justify the slight increase in produce; there are already various non-technical methods that you ought to master first before turning to electronics. I would however be highly grateful for an automated chicken door, so perhaps I’ll start there; and who doesn’t want their own low cost tractor, honestly now? Have you got any garden tech you’d like to share? 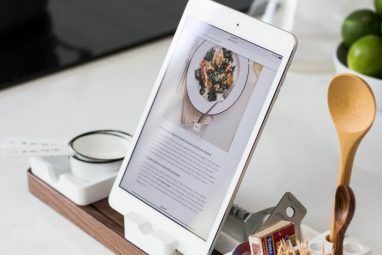 Explore more about: Arduino, Cooking, Green Technology. That dome looks awesome, but you're right, $500 is too much for someone just trying to grow a small amount of food. The good thing is that it'll just get cheaper as the years go on. Boy, does that Horto Domi ever look cool. I think the Global Village Construction Set sounds cool as well, though. Cool post. The Horto domi link is busted, though.